Wonder Girls member So Hee is the cover girl for the August 2010 issue of Dazed and Confused. She sports a new look from her usual Wonder Girls attire,wearing pieces from 3.1 Philip Lim, Christopher Kane, Dolce & Gabbana, Johnny Hates Jazz, Maison Martin Margiela and Rick Owens. Check it out! High quality pictures of 2NE1‘s Pretty Young Thing spread in the August 2010 issue of Vogue Girl was released courtesy of the magazine. In the spread the girls wear pieces from Jeremy Scott, Rick Owens, Alexander McQueen, Alexander Wang, Cheap Monday, Jasmine di Milo and Burberry Prorsum. Check it out! With 2NE1’s 2nd season of 2NE1 tv airing soon, their first album and this, the girls are on top of the Kpop world. 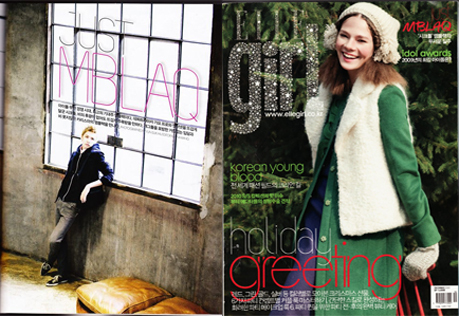 MBLAQ posed for the December issue of Elle Girl Magazine and also shared some unknown information about them selves. In their denim and leather the boys achieved the Street boys concept. Surprised? I am. For more of their interviewcheck out the Elle Magazine December issue. More to come. I am working on finding their looks from the shoot and their wardrobe during their july 19th perf.